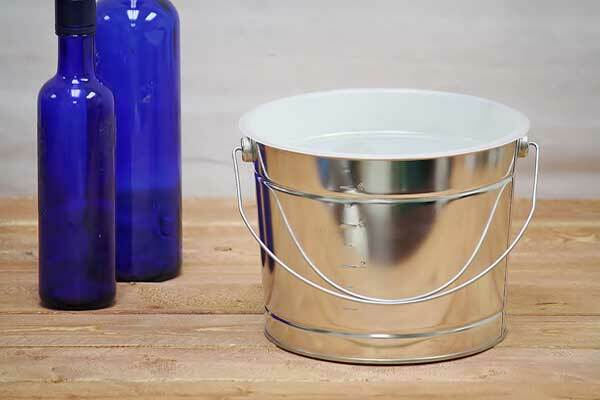 A handy metal paint pail that's lightweight and built to last. The leak-proof single seam along the bottom makes this a contractor's paint bucket of choice. The metal handles swing freely from a smooth rivet attachment. Easily store this metal paint bucket with its tapered design. Liquid quart measurements are permanently embossed on the measuring bucket's side. Made in the USA. Extend the life of your painters bucket with few sturdy plastic bucket liners. Purchase together, individually or separately. Single-use paper bucket liners are available for both 2.5 and 5 quart metal painters' bucket sizes here.